On May 20 (after SPX captured its downside target zone from May 4), I attempted to sort through the virtually-infinite options, and ultimately arrived at a preferred target of 2070+ for the next move. 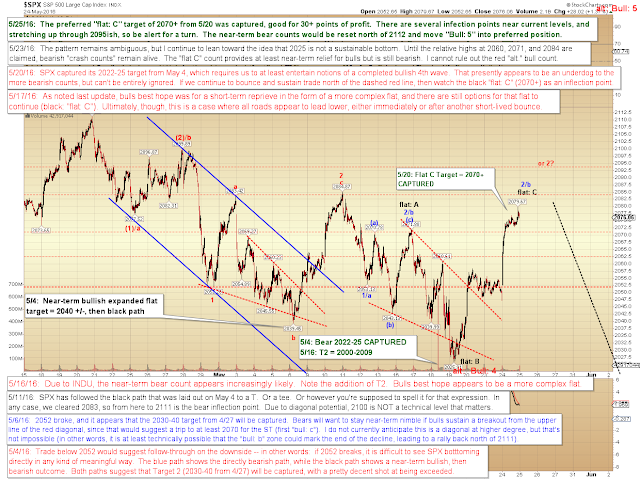 Yesterday, the market captured and exceeded that target. People who are unfamiliar with attempting their own Elliott Wave analysis may not realize that predicting the C-wave of an expanded flat is one of the most difficult calls to make, because there is virtually nothing in the price pattern that tips the market's hand -- which is one of the reasons I included so many caveats when I made that call. In conclusion, there are two options for the C-wave -- one is to stall near current levels (blue 2), the other is to stall north of 2085, but south of 2111 (red 2). The view that 2025 is most likely a B-wave (thus due to be broken) remains modestly preferred, so we should stay alert to a turn developing in the near future. 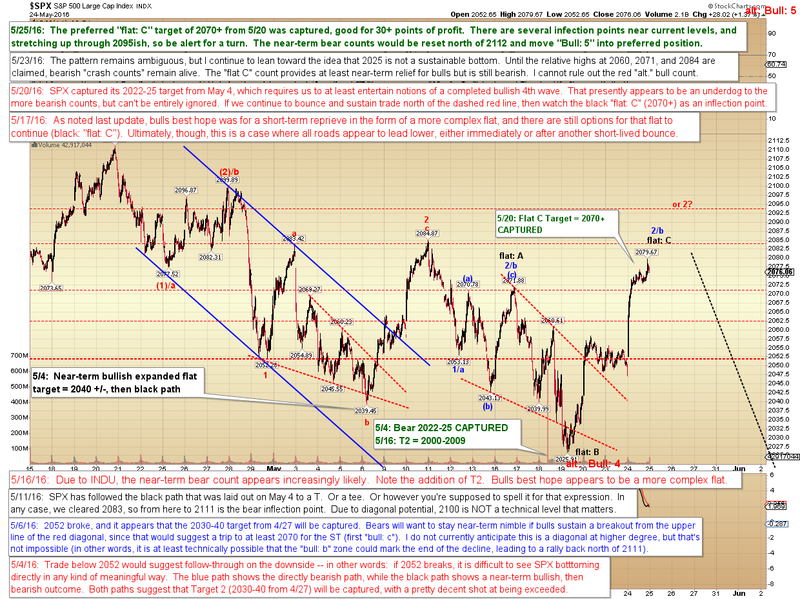 Yet because of the ambiguity at the bottom and the 2022-25 target capture, we can't get complacent here, and have to consider the alternate "Bull: 5" count -- so bears who are inclined to take action may want to act against small impulsive declines, and stay nimble if the level they acted against is subsequently cracked. Trade safe.